DOVER, Del. (Sept. 1, 2016) – NASCAR Sprint Cup Series star Matt Kenseth signed autographs for fans, greeted Philadelphia Phillies players and met with regional media during his visit to Citizens Bank Park on Wednesday night in advance of the “Citizen Soldier 400” NASCAR Sprint Cup Series race at Dover International Speedway on Oct. 2. 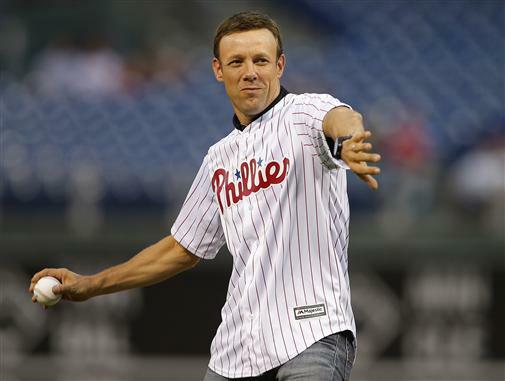 Kenseth said he wasn’t that nervous when he stood just in front of the pitcher’s mound, ready to throw a ceremonial first pitch to Phillies first baseman Tommy Joseph. Still, he admitted it had been a couple years since he threw a baseball, so he made sure to get in a few warm-up tosses in before hitting the field. “I was a little nervous when people kept telling me don’t bounce it,” joked Kenseth. “These events are always fun. It’s always interesting to see how different athletes prepare before a game or event. For the record, Kenseth’s first pitch didn’t come near the dirt, and Joseph caught it cleanly, but it was maybe a little off the plate. “Just missed it by a couple inches,” said the driver of the No. 20 Toyota for Joe Gibbs Racing. The Nationals went on to defeat the Phillies 2-1. After the ceremony, Kenseth met with regional media and covered a wide range of topics, including potential retirement (“no plans as of now”), running an old-school Tide paint scheme this weekend at Darlington and on returning to Dover as a Chase for the NASCAR Sprint Cup championship participant several months after winning the “AAA 400 Drive for Autism” at the Monster Mile on May 15. Before the first pitch, Kenseth, a three-time winner at Dover International Speedway, sat down for an interview on Comcast SportsNet’s “Philly Sports Talk,” met with Phillies players, visited with the team’s radio and TV teams, and also met with fans and signed autographs outside Citizens Bank Park. In addition to the “Citizen Soldier 400” NASCAR Sprint Cup Series race, the NASCAR weekend at Dover International Speedway includes the Saturday, Oct. 1 “Drive Sober 200” presented by the Delaware Office of Highway Safety NASCAR XFINITY Series race and the Friday, Sept. 30 NASCAR K&N Pro Series East race.